The play is inspired by the real story of the French diplomate Bernard Bouriscot and of Shi Pei Pu, a primadona at the Peking Opera, his 20 years lover and the supposed mother of his children. In 1986, a court in France accused and convicted this eccentric couple for spying for China. In an unforgettable scene, Bouriscot found out the real identity of the primadona: in reality, Shi Pei Pu was a man.. He was so shocked that he wanted to commit suicide. When the play was published, many criticised “M…. Butterfly” because it perpetuates the stereotype of the Asiatic effeminate man. Actually, the Asiatic actor plays only two acts of the play dressed as a woman, I’d like to think that the play explains rather well what means to be a woman and what means to be a man. This dispute has far more profound explanations than a man getting dresses in women’s clothes. I wonder if, by combining fantasy and reality, it is really possible to see the truth within a culture, within someone we love or even within ourselves. Will we be chained forever within our subjectivity and forced to understand everything trrough our prejudices ? 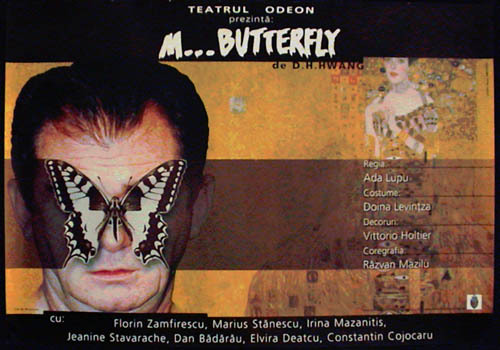 More interesting than the subject itself is the refined construction of the play, based on a parallel with Puccini’s famous opera “Madama Butterfly”. The play is divided into short scenes in which the protagonists are either Gallimard (the diplomate) and Song Liling (his Chinese mistress), or Gallimard and his wife, Helga. Everything happens between dream and reality and is narrated by Gallimard, from the cell where he is imprisoned after the process that revealed to him the lie he was living in. It’s theatre within theatre, but also, theatre as a “court”, as an opportunity to be saved through remembering… The perfect woman is an … oriental man.